Is there any truth to these figures? Anyone care to interpret this statistics? 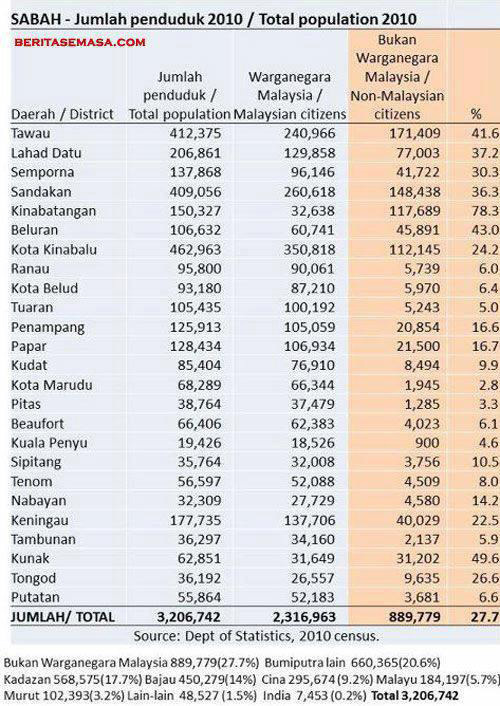 where the foreign population are more than local. and leaving us with all the social problems. Some of the officers are guilty of closing one eye when going through the list of immigrants & population registers, for reason best known to them. Some of us are partly to blame for hiring immigrants who are without proper travel docs or with dubious working permits. But if you are the one holding the 'execute' button and you choose to delay taking the right action, shouldn't you be ashamed of yourself? Procrastinating because you think somebody else would do the job, or you simply don't have the balls to make unpopular decisions. Data from the Statistics Department are "close" but not necessarily "accurate". Usually, the figures depicted here are always "less" than the actual figure. In this case, the difference between the real figure and the reported figure may well be explained by the number of fake Mykads that have gone into the National Registration Department Database. Other sources say that it is between 930,000++ to 1.3 million which is in the ratio of about 1:1. But given their higher annual birth rate, they would overtake us in 5-10 years time. The Data from Statistics Department is ALWAYS an understatement. Other sources put it between 930 K to 1.3 Million, which is close to the ratio of 1:1 by conservative estimates. But given their higher annual birth rate, they may well overtake us in 5-10 years time. So, the year 2020 may not be all that glamorous unless we do away with the Government that lets this happen.